Featuring whole grain sour dough bread and croissant. Saturday morning at the Rochester Public Market is an event. It's a festival every week and we are thrilled to be part of the mayhem. Stop in for something to eat and grab a coffee at Java's. Along with our usual selection of bread and pastry we offer a variety of sandwiches, tartines, and other delicious prepared items. The market isn't the market without an egg sandwich. Ours is made to order - hot and fresh and available on a danish, biscuit, croissant or a roll. 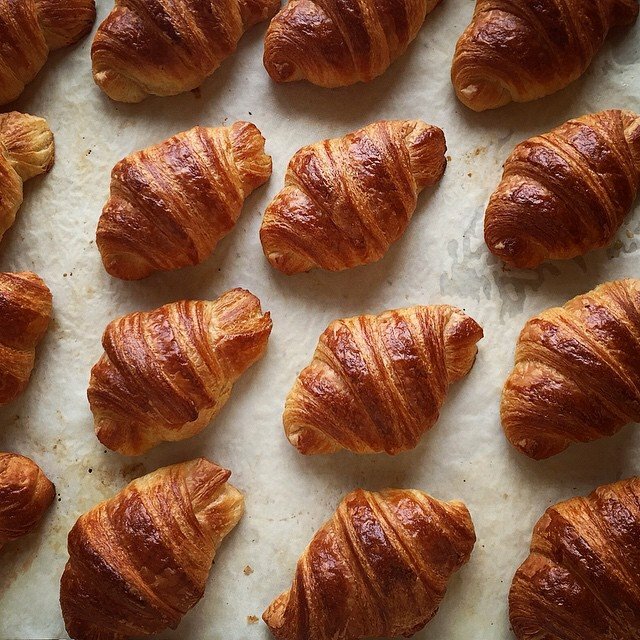 Naturally leavened (or sour dough) bread and croissant hand crafted from organic grains comprise our primary offerings. We do like to tinker with pastry and regularly offer lemon tarts, salted caramel nut bars and canelé. In our extremely short local fruit season you'll often find a tart or crisp made with whatever our farmer's have available. Brioche laminated with copious amounts of Sugarhouse Creamery Dutch Knuckle. We only use the best ingredients and source them locally whenever possible. All of the grain, flour and seeds are organic and none of our ingredients are GMO. The only fats we use are high fat Euro style butter, evoo and organic sunflower seed oil. We take tremendous in pride in the quality of our product and a great deal of effort goes into this sourcing. We use a variety of sources but the majority comes from a small, family owned and operated mill just across Lake Champlain in Canada. We are able to correspond directly with the miller (Sophie) and discuss issues related to flour characteristics and bread baking quality, etc. Our business is built on relationships like these with other small business operators. First Light Farms (East Bethan, NY) Trystan and Max manage a small herd of goats whose milk produces creamy chèvre and tangy feta cheeses. Their cheeses appear in many of our baked goods as well as topping every single one of the many breakfast sandwiches we prepare every weekend. Thank you to the Sandvoss brothers for their continuing awesomeness. Sugarhouse Creamery (Upper Jay, NY) This is simply the best - Alex and Margot have a family of brown Swiss cows which are 100% pastured and grass fed. The milk they produce is truly world class as is the cheese they craft from it. We're lucky enough to source this cheese directly and the Dutch Knuckle appears regularly in our brioche cheese bread. The farm oozes bucolic perfection and with two AirBNB spaces available anyone interested in a ADK getaway can experience this special place. Kopicki Apiaries (Webster, NY) Mike Kopicki is well known in the honey world and oft referred to as "the bee whisperer." The passion and knowledge he has for his craft is irrepressible and reveals itself in the quality and flavor of his honey. If you seek the finest raw honey from pesticide free bee hives grab a jar of Mike's honey. When available it can be found at the Abundance Co-op and Schutt's Apple Farm - but it sells out quickly.